Does repayment begin during or after college? What is the minimum payment required per month? Will my income after college cover all of my expenses, including loan payments? At the time of disbursement, loans may seem like free money since repayment is not required immediately. It is important to remember, however, that you will eventually have to repay all the money you’ve borrowed, plus interest. Some borrowers may have the idea that the government is too big and bureaucratic to keep track of all the student loans they issue. In the past this was often the case. Yet, even though recent legislation has increased the total amount of loan money available, default rates are dropping, standing currently at about 7 percent. To avoid joining those who find themselves deeply in debt, a good exercise to perform before you decide to borrow money is to seriously consider your current financial situation and then project what your future income and expenses will be following graduation. While this will certainly be a difficult task, it could prevent you from extending yourself beyond your financial means. To financially plan your future, you need to estimate the total cost of your education, then estimate the amount of money you expect to earn after graduation in your chosen profession. (See the entry-level income chart) Now deduct your cost of living expenses to determine how much money you have left for monthly loan repayments. A financial advisor or loan officer at a bank could help you with any of these formulas. 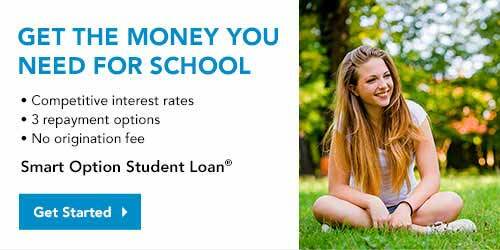 Stafford Loan: These loans are either subsidized or unsubsidized. Your school makes the final determination based on financial need. PLUS Loan: These loans, available to parents of students, are unsubsidized, accruing interest while the student is in school. Parents do not have to prove financial need to secure one of these loans. Perkins Loan: These loans, based on “exceptional” or “extreme” need, are subsidized by the government and generally have a lower interest rate. TIP…Since many schools favor a January or February deadline for filing all aid forms, which is typically too early for most people to have completed their annual income tax returns, it is acceptable to estimate your yearly earnings on financial aid forms. When you sign a promissory note, you are agreeing to repay all the money you borrowed. A promissory note is a binding legal document stating the amount of money you are borrowing and the terms under which the loan is to be repaid. Repayment on almost all of the federal and state student loans begins after the borrower has graduated from college or drops below half-time enrollment status. A grace period typically follows this type of a change in student status. A grace period is a specific amount of time before loan repayment begins. Most grace periods last between six and twelve months, depending on interest rates and the type of loan. Subsidized and unsubsidized Stafford Loans have grace periods of six months after graduation, during which time students can organize finances and find jobs. The difference, however, is that interest continues to accrue with unsubsidized loans, while there is no interest charge for subsidized loans until the day the first payment is due. Perkins Loans allow grace periods of nine months. At the end of the grace period, if the lending agency has not already contacted them, students are responsible for contacting the agency carrying their loan to inquire about repayment schedules and methods. Loan payments are usually made on a monthly or quarterly basis. As a borrower, you are responsible for making these payments on time. If you are very late or fail to make payments, your loan will become delinquent. Delinquency is defined as “failing to make loan payments when they are due,” and your loan will remain as such until the overdue balance is settled or other arrangements are made. Other arrangements for loan repayment are discussed within specific loan sections later in this report. There are several options to prevent you from defaulting on your loan(s). Guarantee agencies offer borrowers the chance to defer payments for financial hardship and other reasons, and there are even situations in which a portion of your loan balance may be forgiven. Keep your loan agency informed of your financial situation. Loan officers want to work with you to prevent delinquency or default. Loan consolidation is a repayment option for students with multiple outstanding loans. Consolidation can help you avoid default or delinquency. If you borrowed money from several different state and federal loan programs to cover the cost of your education, you may be able to consolidate those loans into one. Consolidating your student loans will most likely lower your monthly payments and make the repayment process simpler because you only make one monthly payment. The interest rate on consolidated loans is no more than 8.25 percent for Stafford Loans and no more than 9 percent for Perkins Loans. Sometimes, however, a loan agency averages the interest rates from all your outstanding loans and uses that rate, which is typically higher than 9 percent. The total amount you owe, interest rates, and the amount of your monthly payments are determined by the agency that carries your loans. To consolidate your loans, you must have begun to make payments or be in the grace period before repayment begins. Borrowers who are more than ninety days delinquent in payments or are in default will not qualify for this program. If you are eligible for and interested in consolidation, contact your lending agency and tell them how much you owe on your loans and the kinds of loans you have. If you have Stafford or Perkins Loans, the agency will purchase them from the federal government and handle all collection and payment methods. UPDATE: Learn about Special Direct Consolidation Loans announced by the Obama Administration. These loans are different from the Direct Consolidation Loans typically offered by the government. Read this White House press release from October 2011 for more information about student loan relief. TIP…Remember, any questions or concerns about repayment, cancellation, deferment, or borrower responsibilities must be directed to the organization carrying your loan.